One of the hidden gems in the premium sedan segment is Acura’s RLX Sport Hybrid; a stealthy, road carving machine with a super-smart all-wheel drive system. Well now, Acura has applied that same Sport Hybrid powertrain to the 2017 MDX, the brand’s flagship SUV. Even though they only have 2 of them, Acura sells nearly twice as many SUVs as they do cars. And the MDX is their best example. Sharing a platform with the Honda Pilot, it was last redesigned for the 2014 model year and receives a restyle and refresh for 2017 with a new face including LED fog lights and a host of upgraded content, including the AcuraWatch suite of safety features becoming standard. On top of all that, there’s the introduction of this Sport Hybrid variant; the brand’s first hybrid SUV. There’s no plug here, but gas mileage is still very commendable. The biggest gains are made in around-the-town driving, where the Hybrid nets an honest 26mpg as compared with 19mpg in the gas-only model. Premium fuel is required, regardless. Most hybrids use 1, maybe 2 electric motors to augment the gas engine with additional power. But this MDX uses 1 motor at the front and 1 at each rear wheel to truly give credence to the term Super Handling All-Wheel Drive. This adds a modern twist to Acura’s torque vectoring all-wheel drive system by using an electrified Twin Motor Unit in the rear. It’s fed its power from a lithium-ion battery pack. The two 36 horsepower motors work independently to both get the car through turns more gracefully and to regenerate power for the battery. Creating what is called a yaw moment by sending more power to the outside rear wheel during cornering, this motor-based Super Handling All-Wheel Drive system can create larger power differences between the left and right rear wheels substantially embellishing its influence. The front motor is built into the 7-speed dual clutch transmission. Depending on driving style and the road conditions, the MDX Sport Hybrid can be driven by the rear motors alone, the gas engine alone, motor assisted or a combination of all components. Unlike the RLX, the MDX uses a smaller 3.0-liter V6 as the gas-powered part of the equation. The rest of the electrified components are the same. Total system output is 321 horsepower and 289 pound-feet of torque, considerably more than the standard MDX. Though the effects aren’t as magnified as in the RLX, the Sport Hybrid treatment is the way to go for the MDX. Not only do you get substantially more power and far better fuel economy, but it’s more fun to drive and quieter. It really is an excellent 3 row SUV. And with the Hybrid, you get to replace the balky 9-speed automatic with this much preferred 7-speed dual clutch gearbox. Its electrification makes this MDX feel spunky with immediate and seamless power delivery with a greater willingness to change directions, further enhanced by these 20” Continental CrossContact LX Sport tires. Advances in regenerative braking aid in efficiency and feel superior to any other hybrid I’ve ever driven with no weirdness or grabbiness. And the Integrated Dynamics System in here gets another level; Sport + to compliment the Comfort, Normal and Sport settings with the highest level of throttle response, EV assist, dynamic handling, steering response, model exclusive shock tuning and racy sounds, which this MDX provides surprisingly well. 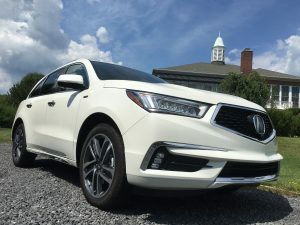 But even if you’re not into driving for Sport, this model uses its hybrid genius to benefit the MDX in all situations, plus you lose nothing in terms of interior space and versatility. So go ahead and put a couple of kids in the easy access 3rd row with a couple of USB ports, another 2 adults in the 2nd row captain’s chairs with a deep storage center console or fold them all down for a truly flat, spacious cargo floor. There’s even decent space with them all upright and large underfloor storage. A couple of knocks would be the absence of a hands-free tailgate and sorry, you cannot get the rear entertainment system on this model. Plus, a big panoramic sunroof would be nice. Manufacturers are in a tough spot with aging infotainment. They buy these systems during the vehicle’s development and are married to them far beyond their sell by date. So in an otherwise very likable SUV, this nearly $60,000 MDX has a system that can’t match the one found in a $23,000 Civic. And that’s a problem. I’ve been critical of this setup for years so despite some system upgrades for 201i it’s still lacking in appearance, intuitiveness, and smartphone connectivity. The ELS system sounds spectacular, however. The soft and supportive seats automatically trigger appropriate heating or cooling, there’s a new surround view camera and plenty of storage space. And did I mention how quiet it is? Truly a pleasure for both the driver and passengers. The hybrid carries a $3,500 premium plus the cost of the mandatory Technology Package, leading to an MSRP of this top-trim Advance model of $58,975, though the base grade starts at $53,000. Acura’s hybrid system is better and it shows.